Lessons and programs for every musician. We take pride in our extremely versatile teaching staff! We offer a wide variety of music lessons throughout the week for all ages and experience levels. 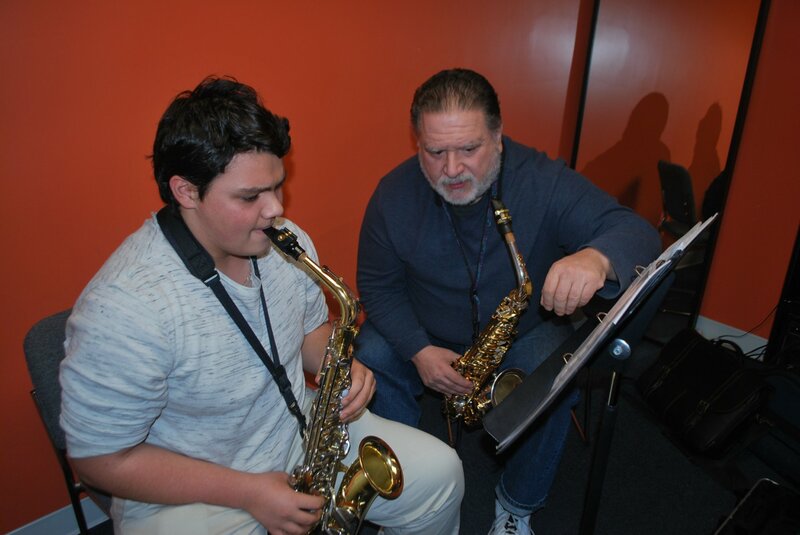 Our lessons are one-on-one to ensure students receive the attention they need to master their instrument. Lessons take place in one of our 8 studios in-store, and can be scheduled as single lessons or in a session package for a reduced rate. More information on rates, cancellations, etc. is available below, or click here to view our lesson policy as a PDF. I didn't enroll before the session start date. Do I have to wait? No! Students may enroll at any time. Sessions are pro-rated, and you will only be charged for the remainder of the session. Absolutely! It's necessary to practice at home between lessons in order to progress. Our staff will happily assist in selecting the appropriate instrument for each student, if you don't have one already! Do I have to bring my instrument to each lesson? We do ask all of our students to bring their instrument with them to each lesson. Drummers and pianists are excluded, and we have their instruments available in their lesson room. If a student forgets their instrument, we can almost always provide one for the lesson at no-cost! How do you match teachers with students? Our entire teaching staff is extremely versatile, and able to teach any student regardless of age/experience level. We do not publicly disclose resumes, but rest assured that every single one of our teachers has been vetted for qualifications and background. We do everything in our power to ensure a quality, safe, and fun education for every single one of our students. That in mind, we typically pair people up based on availability. We want to make sure lessons can happen on a regular basis, and value consistency. Is the Crescendo School of Music closed during school breaks? We do not follow any school schedules or closings, as we have students from many different school systems. If a student is away for a break, please refer to our credit policy. In the event of an irregular cancellation for our school, we will notify you and offer to make up the lesson. Single Lessons (no commitment): $57.00 per ½ hour and $114.00 per hour. Single lessons are booked on a first come, first served basis, no more than one week in advance. Once booked, single lessons may not be cancelled, rescheduled, or refunded. Session Lessons (commitment): $47.00 per ½ hour and $94.00 per hour. By committing to weekly lessons, on the same day/time, and with the same instructor, for the duration of a session, students receive a discounted rate, and their slot is guaranteed.Sessions are pro-rated, and students may enroll at any time. If you would like to continue with no changes to your schedule in the following session, no action is required. If you wish to change your lesson time or opt out of lessons, you must notify usby the respective dates above. Late changes will incur a $25 fee. No changes will be made or refunds will be given once the session has started. Once per session, each student is eligible to receive a credit for a cancelled lesson, as long as the cancellation is made at least ½ hour in advance of their scheduled lesson. Credits may be used to schedule make-up lessons, and if not used by the end of the session, will reduce your following session’s payment by an equal amount. After receiving a credit, make-up lessons may be scheduled at ½ price. No-shows and cancellations within ½ hour will not be credited or rescheduled. 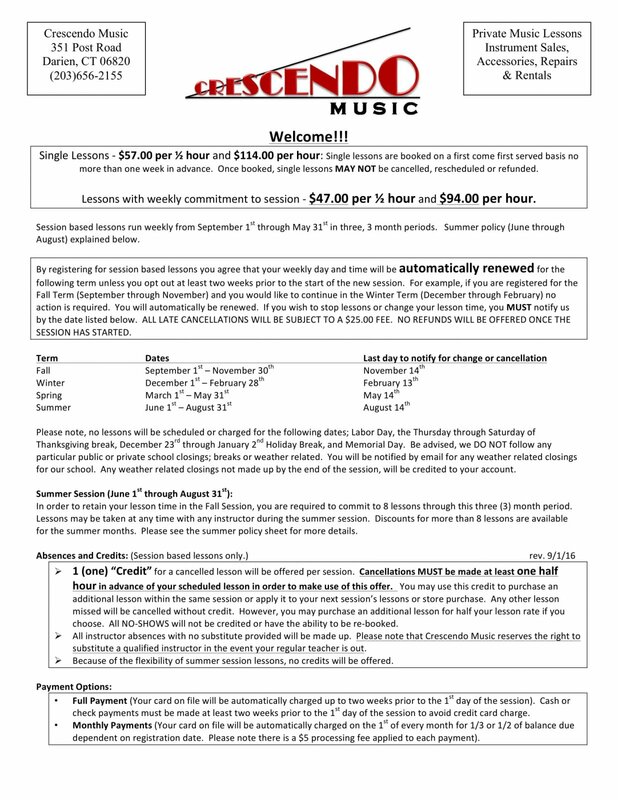 Crescendo Music reserves the right to substitute a qualified instructor in the event your regular instructor is out. Should a substitute not be available, credits will be given which will not count against you. In order to retain your lesson time in the Fall Session, students must commit to 5 lessons during the Summer Session. Lessons may be scheduled and taken at any time with any instructor during the Summer Session, and are booked on a first come, first served basis. Students who take over 5 lessons are eligible for discounts. Due to the flexibility of the Summer Session, no credits are given. Full Payment: Your card on file will be automatically charged immediately following the change/opt out deadline. Monthly Payments: Your card on file will be automatically charged on the last Friday of every month for the following month’s lessons. There is a $5 processing fee applied to each payment, per student. Not available for the Summer Session. We do not follow any public or private school closings. You will be notified via email, and we will post on Cablevision News 12 in the event of any irregular closings for our school. Any closings not made up by the end of the session will be credited to your account.